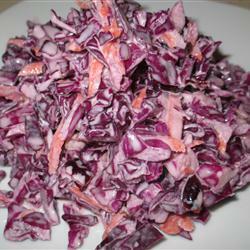 Another great recipe for red cabbage that you should try, the dried cranberries and chopped walnuts gives this slaw a nice texture. Combine cabbage, carrot, mayonnaise, cranberries, walnuts, milk, cider vinegar, and sugar in a bowl; stir well. Cover and refrigerate until chilled, about 4 hours.